I was hoping to do this when the Cards hit a high note, not much high about tonight. I’m tellin’ ya folks, Mulder is DONE. Anyway, for a number of different reasons I don’t think I’m continuing this blog. I may sleep on it a night or 2, but I think this is the end. Not because the Cardinals are doing so bad, mostly because I’d like to have more time with my wife and I have a baby on the way, which I could imagine will cut into time and sleep. While I enjoy writing, I feel like there are a lot of other great Cardinal blogs out there (Viva El Birdos, The Birdwatch, Get Up, Baby! Fungoes, Cardnilly, Cardinal Diaspora, 26th Man and more.) and I know I’m not the best writer in the world, but like I said it was fun. Maybe too much fun, as I have a tendency to go overboard and waste TOO much time not just blogging but surfing the web combing over stats, articles, etc. I do appreciate all my readers and the good feedback, but unless I can find a way to better balance family life, work, church and blogging I’m hanging it up. The site should be up for another week or so, so a crack in the door is open I suppose. Not trying to be wishy-washy or anything, I was going to wait seasons end but what else is there to say but this stinks, that stinks, blah blah blah? If there’s an article of mine you like, better save it now because it will be gone soon. I’m sure I’ll post the occasional diary at VEB, and still comment over there regularly. The 5 Stages of a bad season. Denial. "This can’t be happening" "We still have Albert, Carp and Rolen so we have a chance" "Somehow, the pitching will get it together" "Mulder will be back" "Things could get better if this team every play’s as it’s capable"
Anger. "Why me?" "Stupid, cheap owners hand-cuffing Jocketty this winter" "Jock has lost his magic" "Izzy is garbage" "Boo Juan Encarnacion!" "Cardinal fans deserve better" "These bums don’t deserve to play in October"
Bargaining. "God, I’ll give you my firstborn if the Cardinals can just stop being so frustrating and start winning!" Depression. "When does football season start?" Acceptance. "This is a bad team". "Even if they make it to the playoffs, good luck getting past the first round." "So, who’s in 07’s free agent class?". I’ve officially had it. Izzy is Jonah. Throw him off the boat and maybe the waters will calm. Well, don’t do that, but at least relieve him from his closer’s duties temporarily and let him pitch in some lower leverage situations until his chronic gopheritis heals. Isringhausen has had his ups and all, but far too many downs to the tune of 9 blown saves. Izzy has been good for around 88% of his saves the last three seasons. This season, 77%, or about 1 in 4 games ends up with Izzy coughing up the lead. 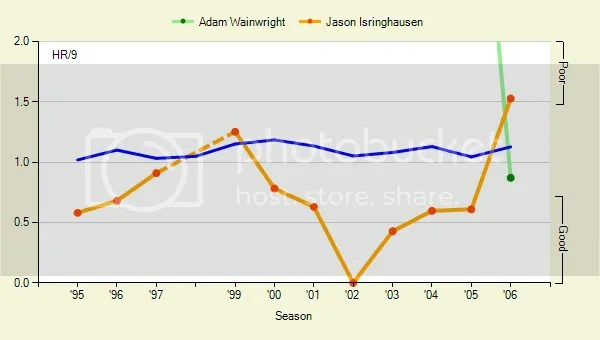 If Isringhausen was his normal, more reliable self we’d be 5 or 6 games ahead of the Reds right now, not just 1. Adam and Izzy are about the same as far as K’s go. Izzy has cut down his walks some later in the season, but Wainwright has been much stingier with the free passes. I don’t know about you, but nothing is more frustrating then watching the Cowardly Isringlion walk guys like Rich Aurilia on 4 pitches to get to anyone, because all to often it’s come back to kill him, much to Cardinal fan’s chagrin. But worst of all is the homerun rate. This is the clincher. All too often we’ve seen him try and go back to his Benedict Arnold cutter, which usually ends in him walking off the mound with a despondent look on his face as the opponents are mobbing each other at home plate. 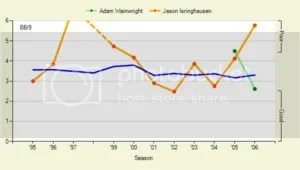 On the other hand, Wainwright has allowed less then a HR per 9. I know that some would argue that Adam’s only a rookie, but he’s already been in the fire of high leverage situations and has come out on top more often then not. My only concern, and it is a big concern, is his platoon split. Righties are hitting under .200 against Adam, southpaws over .300. Not only could that render him ineffective as a closer, it hurts his ability as a set-up guy this year and a starter the next (if that’s still the Card’s plan for him.) If he could remedy that, it would go along way. I have no idea if those sort of splits have dogged him throughout the minors or not. All I know is for now, please no more Izzy. As for the game, you hate to see 7 RBI’s from Albert go to waste like that. I’ve been a fan of the Weaver trade, but the guy is mental. Just watching his body language and facial expressions is sick. He loses it all to often. That was a back-breaker of a game, and I’m not sure we can come back from that one. I’ve gone from being a Dunc optimist starting to be a Dunc believer. As the season goes on, those HR swings are getting to be more and more beautiful. He’s not longer falling to his knees when he takes a good cut, and it doesn’t seem to matter if the pitch is a fastball or curve, up in the zone or below his knees, he can go yard at anytime. Whether it’s just a hot streak or what, it’s getting harder and harder to believe that he’s not for real. The name ‘Francouer’ comes to mind when you think of mid-season rookie hot streaks , but the difference here is that Duncan actually can show some restraint and selectivity at the plate. Hey, he played good defense today as well. 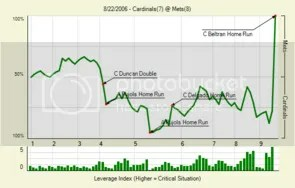 Dunc’s win probability added is 1.01, 3rd among Cardinal hitters behind Pujols and Rolen. Who wouldn’t mind having Rule 5 pick Juan Mateo back? That first inning was rough, but as the game went on he looked very sharp. Cubs fans should be pretty excited about his progress from here. With all the pitching woes in the rotation, a guy like Mateo would be nice to have around now. Stupid visa issues! Carpenter continues to be nails. He’s just such a contrast from the rest of the rotation. For example, yesterday in the 4th inning Suppan just wilted under the pressure he was under, looking for that perfect pitch to get him out of the jam and taking forever to get with Molina on the signs. Carpenter had a man on first and second due to a silly error on Juan E. But rather then getting rattled, he went right after Nevin and induced a DP. I know the rest of the staff may not have Carp’s talent, but you wish they had his confidence and mental-toughness. 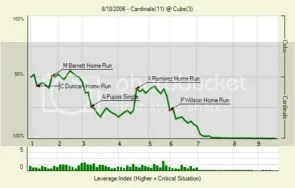 Is Yadier Molina the most unlucky player in baseball? He stung the ball hard in 3 of his at bats, but to the fielders for outs except for his double. According to PrOPS, (Projected OPS), Yadier should be batting .288 with a .740 OPS. While that’s not terrific, it’s a far cry from his .217/.273/.329 numbers he has going into today’s game. (For those of you who aren’t familiar with PrOPS, it’s developed by JC Bradbury from The Hardball Times and the blog Sabernomics. It’s a formula for predicting what a player’s OPS should be in the future based on batted balls, strikeouts, home runs and walks. ) From watching Yadi, it seems like he hits the ball pretty hard, just to the guys with the gloves. If he could ever .280/.740, coupled with his defense, and the outcry to get rid of Molina would be silenced. Hand it to Juan for jumping on a mistake and driving it a long way for a 3 run homer. He ain’t a world beater, but he does have his uses. –From the Simpson’s Episode Homer at the Bat. Unlike the Simpsons episode, Juan wasn’t plunked in the head unconscious for a game-winning RBI. In the last 7 days, Juan has been hitting .208 in 24 at bats, Dunc on the other hand-.563 with a .913 slugging % in 23 at bats and has been the teams hottest hitter. Duncan had already tied the game with a dramatic homerun earlier, but apparently Tony just had to prove he’s got the magic or something. Now if you do look at Dunc’s minor league splits, it’s true that he doesn’t hit lefties well while Ohman has shut them down. But again, are you going to trust a struggling Juan or go with the hot hand? Duncan did hit a homer previously against Rheal Cormier not long ago during this hot streak, so it’s not like he hasn’t been there before. What is it about Dusty Baker that seems to bring the worst out in LaRussa? Is he trying to re-create a dramatic script for another 3 Nights in August? I don’t get it. Not to say LaRussa is a bad manager, obviously he’s far from that. I can see what he was trying to do by playing the numbers, but I think when most fans saw Encarnacion come to the plate in favor of Dunc, we all had that sinking feeling that things were shifting in the wrong direction. It wasn’t just LaRussa to blame for today’s loss. Suppan’s wildness didn’t help either. Watching him trying to get together with Yadier on the signs was unbearable to witness. It’s like he was trying to find the right cord to pull to diffuse the ticking time-bomb. Jeff started the game great, working quick and challenging hitters. You hate to see a pitcher beat himself, and that’s exactly what Soup did. Albert Pujols- 450 feet, 115.7 mph!!!! That’s montrous!! Put all the Cardinals homeruns together and in distance they equal around half a mile, 2535 feet to be exact. Nothing wrong with taking a flyer on Wilson, especially since it’s going to cost the Cards next to nothing. From what I’ve seen watching the game today he looks like he’s got plenty to prove after getting cut the Astros, smashing a liner for a single and a bomb to center field. He’s a plenty better platoon partner for Edmonds then So Taguchi, (.370/.495/.469 in his last 305 AB’s verses southpaws). And while we’re hearing the news is good on the Jimmy front, it’s not too shabby to have Wilson in your back pocket should Edmonds start getting whoozy again. What ticks me off however…Anthony Reyes was sent down to make room. I know he’ll be back in September which gives Marquis enough time to turn back into Mr. Hyde so perhaps everything will be okay. The word is Eckstein is out with an oblique strain. (This again?) With Aaron Miles as the backup shortstop I’d like to think Jocketty would hit the waiver wire again. Craig Counsell is on the mend and he’s not going to reclaim his job from the other Drew who is mashing in Arizona right now. Counsell is essentially the same player Eckstein is, plus a few inches, a bizarre batting stance and range. It’s not like Eck’s been lighting the world on fire anyway since his concussion (what’s with obliques and concussions this year?). If no Counsell, I’d like to see DanUp’s favorite pet Junior Spivey get the call up. Since Spivey’s tiff with Danny Sheaffer, Spivey’s been lighting it up for Memphis, hitting .286/.412/.679 in August. He’s only played 2 games and SS for his career, but I’d sooner see him then Miles. EDIT: I was wondering where Wilson’s power has went this season and Fangraphs.com is very telling. See for yourself. 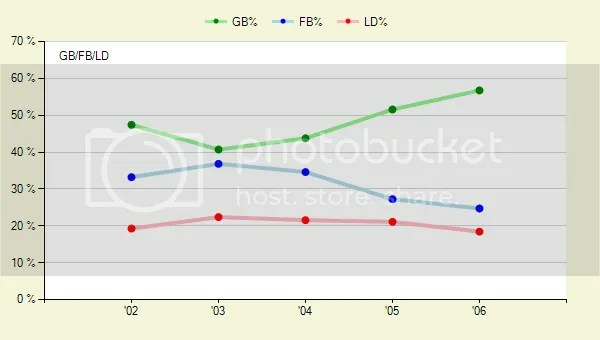 A dramatic lift in grounders and decline in fly balls.